This is Engel's invitation for the trade fair we are going to attend in a few days. On ShowUP I'll share a stand again with my friends from Snor Publishers and Sabien from Engel will be my next door neighbour! 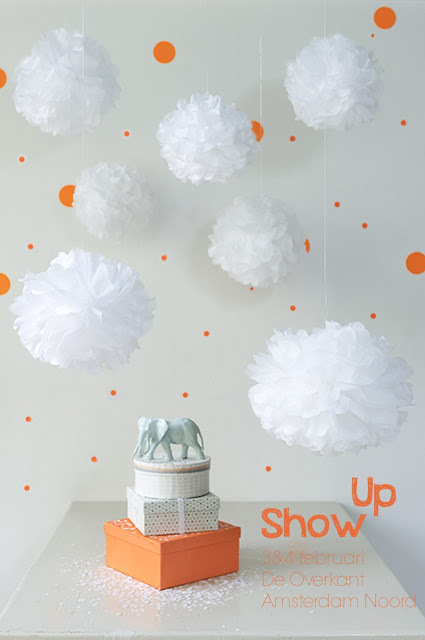 There are 25 great wholesale companies presenting their latest designs on ShowUP. The trade fair will be held next Sunday the 3d and Monday the 4th of February in a beautiful old industrial building alongside the water in the upcoming neighbourhood of Amsterdam Noord. We are expecting a lot of customers, collegues, bloggers and press. You are most welcome to come and visit us as well. Book a FREE ticket at ShowUP and ShowUP! Two weeks ago I planned to design something new to be launched on the Amsterdam ShowUP tradefair on the 3d of February. 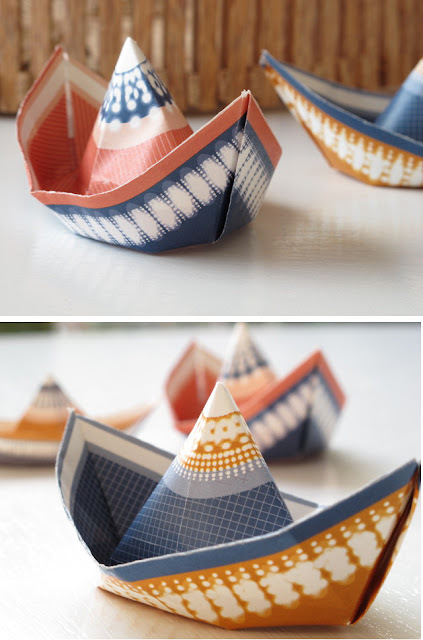 I felt I had outgrown the style of my very first product, the 'little wishboats' (2008) a little, but I'm still in love with the concept, so I chose to restyle them (don't worry: the first fleet will keep on sailing!). 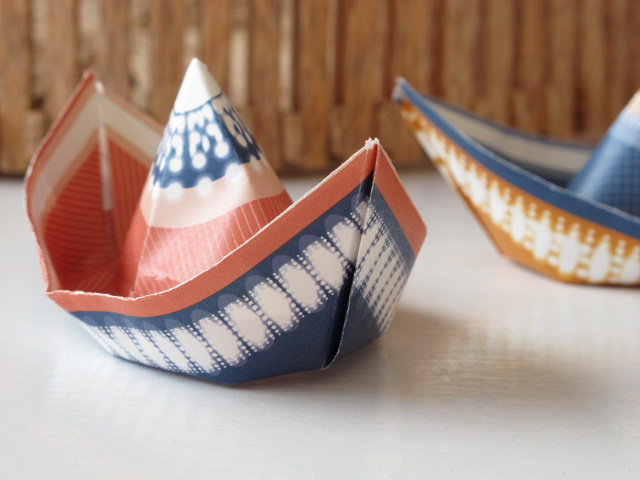 I can understand, but these ragged shibori-style prints, the simple graphic lines and the deep warm colours...this style came straight from my heart yesterday. Just like that. I can only hope my blogreaders and my customers can see, feel and appreciate it. Thank you, heart, I can allways count on you! Oops, my last post was a long time ago, before Christmas 2012... I hope you had some wonderful days together with your loved ones and I wish you all the best for 2013! I would like you to meet some new friends: Stella's ceramic people. They are so cute and stylish! 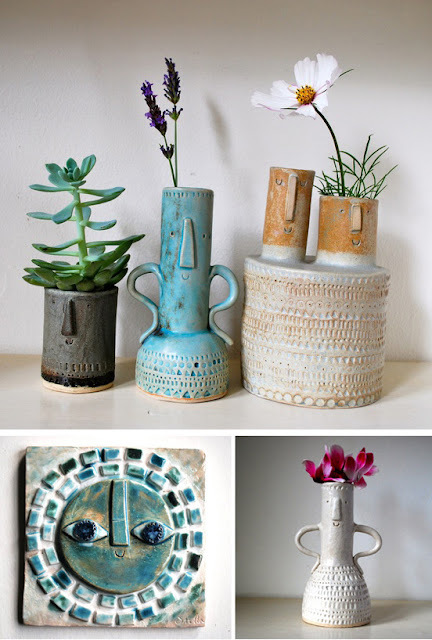 Next to that they have exactly the right colors, glazes, shapes, retro feeling and decoration. Stella Baggott (Etsy shop) from London is a graphic designer/illustrator originally, started making ceramics only recently. All of her work is hand built, and every piece is one of a kind.